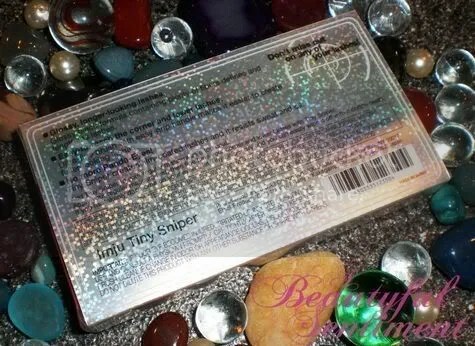 The Claim: Tiny Sniper is the same formula as the Fiberwig top-selling mascara in Japan – beating the competition with remarkable, “false eyelash-like” results. Never miss a lash with Imju Fiberwig Tiny Sniper lengthening mascara. Get a fuller look and extreme reach by catching short, thin, and hard-to-reach corner and lower lashes. Tiny Sniper has a specially designed brush, with its ultra-fine angled head and an easy-to-hold grip, to make precise application a breeze. The glossy black formula defines lashes with an abundance of fibers that easily enhances every tough-to-catch lash. The film coating has the dual effect of preventing smudging, by resisting sweat and oil, and further extending your fabulous fringe. For optimal results, use the original Fiberwig and and the Tiny Sniper together. The Brush: I purchased Tiny Sniper to use as a lower-lash mascara since my pitiful, virtually non-existent lower lashes can use all the help they can get, and the petite angled brush really is quite nice for that purpose. The angle is perfect for sweeping just the right amount of product along your lower lashes, but I find the shortness of the wand makes for some difficulty when you attempt to use this on your upper lashes (to capture those pesky inner and outer corner lashes). The tininess of the brush does make for great maneuverability though! 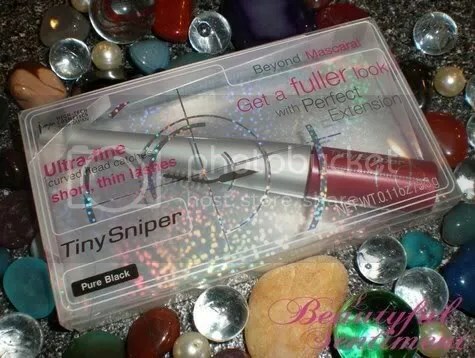 The Formula: I really wanted to love Tiny Sniper, since everything from the clever name and packaging to the cute eyeliner-shaped tube was so appealing, but the fact that it irritated the heck out of my eyes made it a no-go for me. Don’t get me wrong-it was pretty decent at first. I applied this to both my upper and lower lashes (just so that you could see what it looked like on both) and while Tiny Sniper gave me next to no volume, I had really nice length (thanks to the fibers) and definition with a little curl, and my lower lashes, while not that much more visible post-mascara, definitely had some added length as well. The issues came about two hours later at work-something in the mascara caused my ears to start tearing, and it was all downhill from there. The moisture caused the fibers to fall off and collect underneath my eyes, and my eyes proceeded to be teary and itchy throughout the day. I did love that this removes very easily with water, but in my opinion it removes too easily, since the slightest tearing resulted in my ending up with mascara flakies all over my face. Don’t be scared by this photo! I know it’s freaky but just had to show you a side-view so that you could see my lower lashes. The Verdict: If the original Fiberwig doesn’t irritate your eyes, then Tiny Sniper might be worth a try since the fibers provide nice definition and wonderful length, but I just couldn’t get it to work for me. I tried this several more times for the sake of experimentation, but unlike other fiber mascaras that I’ve tried, Tiny Sniper’s fibers kept falling into my eyes throughout the day , and while it never gave me raccoon eyes in that it never smudged, I just couldn’t deal with the little flakes and eye irritation. Plus the tube is seriously small for $15! But for all its detriments, I actually did kind of like it. Read Parts 1-19 of the Mascara Series here! I’ve also added a “Mascara Series” tab up top so you have easy access to it at all times! And see my cursory review of Guerlain’s Le 2 de Guerlain Holiday Mascara here.